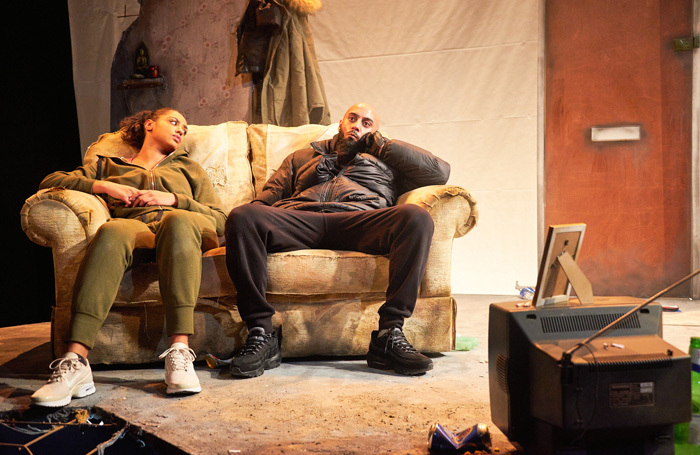 Ambreen Razia’s latest play, Pot, investigates the world of inner-city gang culture from a point of view that we don’t usually see: that of a young woman. On a council estate somewhere in London, there is an abandoned flat – designed with filthy accuracy by Alison Neighbour – that is both of this world and another. While Josh (Wahab Sheikh) uses it as a base from which to run his drug dealing empire in the present, Miles (Gamba Cole) and Louisa (Sophia Leonie) occupy it in another realm, where it is a kind of purgatory for forgotten children of the care system who have fallen casualty to the consequences of street life. While Sophie Moniram’s direction draws out some satisfying detail – the use of the Nokia kick ringtone feels especially authentic – it often fails to imbue Razia’s resonant writing with the nuance it needs to make the play feel believable. The emotions are so heightened, it leaves the actors nowhere to go and renders their characters inaccessible. The play ends with an extract from a recent speech given by Theresa May: if young people are drawn into gangs, she says, then we need to ensure we provide viable ways out. This is a necessarily hard-hitting play; it’s themes, for some, a reality.